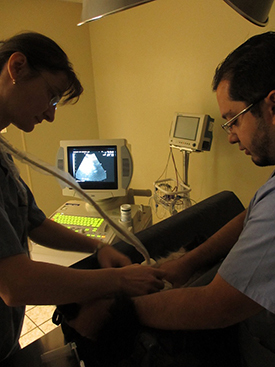 Diagnostic ultrasound offers a non-invasive, pain-free, and safe view at your pet's internal health. We are pleased to offer this powerful diagnostic tool to our patients and their families. Ultrasonography is the use of ultrasonic (high-frequency sound) waves to produce a picture of your pet's internal organs. These waves are emitted from a small probe held against your pet's skin. The waves echo off your pet's internal structures and are picked up by a sensor within the probe. This echo is then resolved into a visible picture, called a sonogram, by the ultrasound computer. This picture allows us to see organs functioning in real time, unlike x-rays. Also unlike x-rays, which emit radiation, ultrasound waves are considered completely safe. First, your pet will be positioned on her back in a comfortable "V" shaped cushion. The area will likely be shaved, to allow the probe to make direct contact with your pet's skin. A conductive gel will be applied, and the doctor will then gently hold the small probe to the area to be visualized. The entire procedure will take between 20-30 minutes and in most cases we'll have answers for you within that same time frame. In some cases, futher testing or consulting with a specialist may be indicated. We can view the size, shape, texture, and movement of your pet's internal organs with this technique, allowing us to assess function and check for any abnormalities in real time. In some cases, ultrasound may be used to guide a fine needle to take a small sample of cells or fluid (fine needle aspiration or biopsy) from an internal organ or even to sample bone marrow from bones. If your pet needs to submit a urine sample for analysis, the ultrasound machine helps us in collecting a sterile sample, as well as giving us a glimpse into the health of her bladder. This allows us to test which bacteria may be causing your pet's urinary issues and perscribe the proper antibiotics. Ultrasound is especially good at visualizing soft tissue diseases that don’t show up well on x-rays. It allows us to differentiate between fluid-filled cysts and solid tumors, find blockages or fluid build-up, measure organ size and disease progression, and visualize stones. Thus sonograms make it possible to quickly and painlessly diagnose a number of different ailments, including those affecting the liver, spleen, gallbladder, kidneys, and some forms of cancer. This makes ultrasonography a very important component in our diagnostic toolbox, and integral to providing you and your pets the most complete and state of the art care possible.